For the 2018-2019 season, the nasal spray flu vaccine (live attenuated influenza vaccine or “LAIV”) is again a recommended option for influenza vaccination of persons for whom it is otherwise appropriate. The nasal spray is approved for use in non-pregnant individuals, 2 years through 49 years of age. People with some medical conditions should not receive the nasal spray flu vaccine. All LAIV will be quadrivalent (four-component). The age recommendation for “Fluarix Quadrivalent” was changed from 3 years old and older to 6 months and older after the annual recommendations were published last season to be consistent with Food and Drug Administration (FDA)-approved labeling. The age recommendation for Afluria Quadrivalent was changed from 18 years old and older to 5 years old and older after the annual recommendations were published last season to be consistent with Food and Drug Administration (FDA)-approved labeling. The United States experiences annual epidemics of seasonal flu. This time of year is called “flu season.” In the United States, flu viruses are most common during the fall and winter months. Influenza activity often begins to increase in October and November. 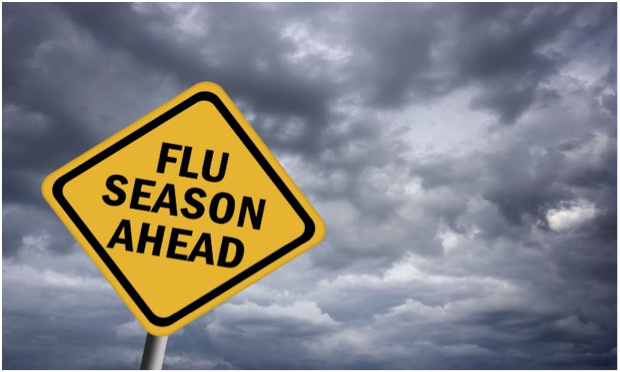 Most of the time flu activity peaks between December and February, and it can last as late as May. CDC monitors certain key flu indicators (for example, outpatient visits of influenza-like illness (ILI), the results of laboratory testing and reports of flu hospitalizations and deaths). When these indicators rise and remain elevated for a number of consecutive weeks, “flu season” is said to have begun. Usually ILI increases first, followed by an increase in flu-associated hospitalizations, which is then followed by increases in flu-associated deaths. How many people get sick with flu every year? The exact number of flu illnesses that occur each season is not known because flu is not a reportable disease and not everyone who gets sick with flu seeks medical care or gets tested. CDC conducts surveillance of flu related illness through the Outpatient Influenza-like Illness Surveillance Network (ILINet) and FluSurv-Net (see more information on FluSurv-Net in next question). ILINet collects information on outpatient illness, and FluSurv-Net collects information on hospitalizations. For more information, see CDC’s Overview of Influenza Surviellance in the United States. Because the ILINet systems does not capture all influenza-related illness in the United States, CDC uses mathematical modeling in combination with data from traditional flu surveillance systems to estimate the true burden of flu illness in the United States, including total flu cases. CDC estimates that flu has resulted in between 9.2 million and 35.6 million illnesses each year in the United States. For more information on these estimates, see CDC’s Disease Burden of Influenza page. How many people are hospitalized from flu every year? CDC estimates the total number of flu-associated hospitalizations in the United States. CDC’s flu surveillance system FluSurv-NET, monitors rates of lab confirmed flu-associated hospitalizations in about 9% of the U.S. population, and it collects information only on hospitalizations that had a positive flu test. We know that not everyone with an influenza related hospitalization will be captured in this system because not everyone gets a flu test and those that do may not have a positive result if many days have passed since they first became sick. That is why CDC also uses mathematical modeling to fill in the picture of the disease burden. Since 2010, CDC estimates that flu has resulted in between 140,000 and 710,000 hospitalizations each year. For more information, see CDC’s Disease Burden of Influenza page. As it does for the numbers of flu cases, doctor’s visits and hospitalizations, CDC also estimates deaths in the United States using mathematical modeling. CDC estimates that from 2010-2011 to 2013-2014, influenza-associated deaths in the United States ranged from a low of 12,000 (during 2011-2012) to a high of 56,000 (during 2012-2013). Death certificate data and weekly influenza virus surveillance information were used to estimate how many flu-related deaths occurred among people whose underlying cause of death on their death certificate included respiratory or circulatory causes. For more information, see Estimating Seasonal Influenza-Associated Deaths in the United States and CDC’s Disease Burden of Influenza page.